But even though they can be a pain in the you know what if not managed (harvested regularly), you absolutely have to grow sweet potatoes! Why? Sweet potatoes are the perfect substitutefor normal potatoes. Sweet potatoes have less disease problems. Growing sweet potato vines is much easierthan growing other potatoes. Sweet potatoes are very nutritious. And sweet potatoes grow with little water and fertilizer. Young sweet potato shoots and leaves are yummy in stir fries and salads. Sweet potatoes also make a wonderful quick growing ground cover. You can use them as a living mulch and to keep weeds down. So, how do you grow sweet potatoes, and how do you keep them under control? 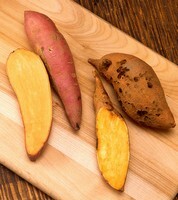 There are sweet potato varieties with red, yellow and white tubers. The red ones have the highest vitamin A content, and have become the most popular variety. But all sweet potatoes are very nutritious in general, especially if you use the leaves and shoots, too. You'll be hard pressed to find a plant that produces more nutrition per square metre than the humble sweet potato! Sweet potatoes like growing in sandy soils, lots of sun, lots of space, and a reasonable amount of water and nutrients. They love heat. The hotter it is the faster they grow. Sweet potatoes don't like heavy, waterlogged soils, cold weather, and fertilizers high in nitrogen (like chicken manure, it makes them grow lots of leaves but no potatoes). The quickest and easiest way to grow sweet potatoes is to use cuttings. Simply cut a piece of a runner, about a foot (30 cm) in length. Remove all the leaves except for the tiny leaves at the very tip. Plant the cutting by covering the whole length with soil, only the leaves of the tip should stick out of the ground. The cuttings will root at every leave node. Not just the leave nodes under the ground will root. A sweet potato also grows roots from every leave node that develops as your cutting grows. If you can't get hold of cuttings you can start growing sweet potatoes by planting the tubers. You can use any shop bought sweet potatoes. Place them on the ground, cover them with soil, and keep them moist. The tubers will develop shoots, called slips. Slips can be snipped or pulled offand planted out when they are about 15 cm in size. The original root will continue to produce more slips. It's a popular project in school classes: growing sweet potato vines in a glass of water. You can do that by putting a tuber into water, pointy end down, with the top third above the water. Slips will grow from the eyes of the tuber. You can plant those shoots out just like the slips grown in soil. Some people root the slips in water as well. It's nice to watch for children, but it has no benefit whatsoever. Rooting any plant in a glass of water does not make sense, other than for demonstration and teaching purposes. The best soil for sweet potatoes is sandy, but they can grow in all soils. If you have heavy soil plant sweet potatoes on mounds or ridges. The soil should have a good supply of nutrients, for example from digging in mature compost. Do not use fresh manures or any fertilizers high in nitrogen (like pelleted chicken manure). You'd just end up with lots of leaves and no tubers. Mulch thickly between plants and even between the beds to intially keep the weeds down. Once the sweet potatoes grow they will choke all weeds down themselves. For planting time the general recommendation is to plant a patch in spring. (May in the northern hemisphere, November in the southern). In a cool climate you may indeed have to get by with a single planting. Sweet potatoes do need four to six months of reasonably warm weather to mature. But in the tropics one big spring planting does not make sense, unless you are a commercial grower. Sweet potatoes don't keep well after harvest, so the best way is to plant a few cuttings every week or two. Just one row of one metre length, with three cuttings. They will take about 16 to 18 weeks to mature in warm weather, longer in cooler weather. That way you can grow sweet potatoes all year round, and you don't find yourself with a big pile of them all at once. If you have enough room you can also plant a permanent sweet potato patch. I did. When I started growing sweet potatoes I didn't plant in rows. I have plenty of space, so I planted some sweet potatoes as a ground cover under most of my fruit trees. They did extremely well, and now my whole orchard is covered in sweet potatoes. They don't need any care, and when I want some sweet potatoes I can usually find a few there. I just look for a thickened stem, or walk around feeling for a lump, and start digging. It's too easy. Although sweet potatoes are a very tropical vegetable they can get by with little water once established. However, the freshly planted cuttings need to be watered regularly. Make sure plants don't become waterlooged. If your soil isn't free draining it's safest to grow sweet potatoes on mounds. Just make sure you use a balanced fertilizer, for example seaweed extract. A sprinkle of sulfate of potash also doesn't go astray. Compost that had lots of wood ash in it is even better. Avoid high nitrogen fertilizers. Root crops like potassium and phosphorus, not nitrogen. After four to six months, depending on the temperatures, your sweet potatoes will be ready. You will see that the original stem of your cutting or slip will have thickened, and when you carefully lift the plant with a fork you should find two or three sweet potatoes at the base. You can harvest sweet potato leaves and young shoots at any time, it does not affect the plant or tubers. In the tropics sweet potatoes have one serious pest, and that's the sweet potato weevil. An adult weevil is a metallic blue and orange and about 6 mm long. It eats everything, stems, leaves and roots. The weevils lay their eggs in the roots, and the larvae tunnel through the roots and make a rotten mess of them. If you have problems with sweet potato weevils you can't grow a permanent sweet potato patch. Just use the other sweet potato growing method. Plant slips or cuttings, that way you don't transfer any weevils. Dig up the whole crop, don't leave any tubers in the ground, and start afresh with cuttings in a different bed. That way weevils will never be a problem again.